Greetings. I would like to first say thank you to my opponent for engaging me in this exercise. I have a feeling this debate will be quite interesting. You see my opponent and I both believe in the Resurrection, but for my benefit my opponent will be playing the side of the con. Since such is the case, I would like to make a request of the reading audience, to look at the debate objectively, and look at the arguments each side presents, and not at the pre-beliefs of either debater. I will begin by saying that the historical Resurrection of the Lord Jesus Christ is the truth on which Christianity lives or dies. The apostle Paul plainly said if Jesus Christ did not rise from the dead, our faith is false and we are still in our sins. So is the topic of any significance? You bet. What makes Christianity so unique is that it is a historical faith that makes historical claims. Our faith does not rest solely in some ethereal dimension, or some philosophical meanderings. Christianity says it is true because a physical Man who walked this earth was dead and then returned to life. And that is what we will be debating today. Let us begin. I do not believe my opponent will call this fact into question, so I will continue forward. There is another fact that I would like to put forward, that the earliest Christians and the disciples sincerely believed that Jesus Christ rose from the dead and not only so, but appeared to them. The apostle Paul's first letter to the Corinthians (mid 50's) contains one of Christianity's earliest creedal statements, That is that Christ died and rose again and made numerous appearances (1 Corinthians 15:4) Paul tells us this is what he and the other apostles were preaching (1 Corinthians 15:11) early church writings also continue on in this belief (Epistle of Polycarp to the Philippians 2:2, to name just one) We also have uniform traditions recorded by the early church writers of the apostles all dying as martyrs, and Josephus also records the martyrdom of James the brother of Jesus. Now, please note, I am not arguing that because the disciples believed that Jesus rose from the dead and appeared to them, that means it is true. I am arguing that we have enough historical evidence to know that they believed it to be true. And that is the question I will be focusing on in the entirety of this debate. Why? Let us go in our minds back to the first century time of Christ. The most shameful and horrifying death in the empire is undoubtedly crucifixion. It is a death of slaves, rebels, and criminals. And now we have a problem, the Man who you were following for three years, who you believed was the Messiah and would liberate the Jewish people,, just got crucified. That's a problem. Yet Christianity did not end as a failed Messiah story. Nobody forsook the idea of Jesus of Nazareth, only to have the faith in Him be relegated to the margins of Jewish history where Sabbatai Sevi and Bar Kochba dwell. Even though this is exactly what should have happened given the current circumstance, a crucified Messiah. I would urge my readers to think about this for a moment. Imagine the absurdity of preaching a crucified Man as God incarnate to the pagan world, and the Jewish world at that? To expect a first century Jew or pagan to believe the Messiah or Son of God was a Man from Galilee who died the death of slaves would be the equivalent today of a group of people in England claiming the new queen was a woman on death row in a Liverpool prison. It doesn't work. Everything about Christianity was wrong, We have 11 people who now have a dead Messiah to deal with. So what now? Well, the disciples could have made up a resurrection story to try and still cling to their Messiah. One might argue. The problem arises, why would anyone want to continue to believe in a Messiah they knew was dead? As N.T. Wright pointed out, if your Messiah got crucified you went out and got a new one. Would 11 men travel the Roman empire preaching an absurd message they knew was false? And Jewish men who believed God hated lying at that. That is extremely hard to believe. So I believe it is in good evidence to believe that what they were preaching was sincerely believed. Again, the question is why. Now my opponent is not going to allow for resurrection to be the case, so that means there must be another thesis to put forward besides the resurrection. Why did the disciples believe what they believed? If my opponent accepts these premises, I would like to hear his alternative thesis. 3. It is entirely unreasonable to postulate that the disciples were lying, it would have to be proven they would have something to gain that would far outweigh the sacrificing of their lives. Nobody dies for a hoax. Therefore, it is my conclusion that the best and only explanation for the known data, is that Jesus did in fact rise from the dead. This explains why the disciples were willing to die, the origin of the Christian faith and teaching of Christ's appearances, the conversion of Paul, and the survival of the religion of Christianity when it had many hurdles to overcome, namely, that it's Messiah died the death of slaves. So I will close with a question for my opponent, what other thesis besides the Resurrection does he believe to be sufficient to provide an account for the known data? Hello and welcome to another exciting Edeb8! Thanks everyone for your time! As my opponent has already stated, this debate will be discussing the issue of whether Jesus of Nazareth was resurrected from the dead, after having been crucified. As always we need to establish a base line for what exactly will be debated here. PRO has partially addressed this in the Rules for this debate, and has elaborated on this a little in their initial round, but for clarity's sake I'm going to lay out the definition of the resolution as I understand it. This debate, as stated in the Resolution, this debate will centre on Jesus of Nazareth. Both sides will agree that this refers to the Jesus mentioned in the Bible - a historical figure and the primary focus of the four Gospel accounts. It's important to note that while most sources agree that Jesus existed, there is some significant debate around the issue of whether he was fully Human, fully God, or a combination of both. As this issue will directly impact my case, I've decided to formulate an argument that will address all eventualities. As my opponent has stated, there can be no argument that Jesus was executed by the Romans by way of Crucifixion. We will be taking the standard dictionary definition for "death", namely that it was the end of his life. This leaves one further term to be defined, and it's also a fairly critical one. In the Rules for this debate, PRO has used the term, "Resurrect", however this is slightly different to the term used in the resolution, "... rose from the dead". Not wanting to get weighed down with semantics, we propose that both sides use the dictionary definition of "Resurrect", as defined by the Oxford dictionary as, "Restore to life". Our understanding of this means that it would not be enough for Jesus to simply transition from one state of being to another, that would not be being RESTORED. It's our contention that Resurrection requires Jesus to have ceased life in one state and then be restored back to that same state. I would like to point out that BOP for this debate is squarely on PRO. He must convince us that Jesus was resurrected from the dead. The alternative is a negative, which is very difficult for us to prove. In this debate, we intend to negate any proofs PRO presents. Assuming we are successful, we will have won the debate. To enter into the spirit of the game, we will also offer up some logical points which will firmly establish the reasoning for our position. PRO will need to explain why these points should not stand. We will not be offering an alternative history. It's our contention that Jesus died and stayed dead. If pressed, we're happy to theorise on various claims that he later rose to life, but our personal conviction is that, as the focus of the cult of Christianity, the early church simply rewrote the historical account to claim that he was resurrected. We'll be happy to provide evidence of other cults throughout history who have done the same thing. If it was possible for them, we see no reason to believe it would not be possible for the early church. Taking the world as we see it today, the evidence overwhelmingly points to the fact that Jesus was merely an inspirational man. He was put to death, and we do not contest this. He was definitely dead. For PRO to win this debate, he needs to demonstrate that Jesus the man was fully restored to the same human status he held before his death. 1: Jesus is fully man. 2: Men can't walk through walls. 3: "Resurrected" Jesus walked through walls. 4: Jesus the man was not resurrected. With this syllogism, we're referencing two separate instances mentioned in John 20 where the Disciples are meeting in a locked room. The Bible account simply states that Jesus appears in the midst of them. This is not the only time either. In Luke's account in Luke 24:31, Jesus simply vanishes from the presence of two men he'd been walking and talking with on the road to Emmaus. These are not things possible for a Human to do. Therefore Resurrected Jesus was not Human. And this is not all. Both these accounts also reference the fact that Resurrected Jesus was not physically recognised by people who formerly knew him. Including Mary, who we know had only seen him three days prior to meeting him in the tomb garden. So Resurrected Jesus clearly did not have the same physical facial features he had before. So even if he WERE restored to life as a human, (which he clearly wasn't since humans can't appear and disappear at will) he obviously wasn't in the same body, meaning that he did not meet the dictionary definition of resurrection. OK, so what if the Bible account is true and Jesus was actually God? 1: Jesus is fully God. 3: Something that didn't die can't be resurrected. 4: Jesus the God was not resurrected. See here's the thing about God. He can't die. His eternal nature is part of what makes him God. If you can't die, then you can't meet the definition of Resurrected, since that requires you to have died first. We'll also reserve the right to point out that the Bible also paints us Humans as eternal in nature as well. John 11:25-26 says that we never really die. Even when we die, we live. And that people who believe in Jesus will NEVER die. Assuming that Jesus believed in himself, the Bible tells us that he didn't actually die - so therefore he can't have been resurrected! I'm guessing that PRO, like many modern Christians may subscribe to the theory that Jesus was both fully man AND fully God. If this is the case, then he will need to explain how exactly God can die, and also dig up some evidence for us that proves that whatever that resurrected Jesus looked like, that his body was restored to its pre-death fully human state. PRO points out that the Disciples believing that Jesus rose doesn't make it true. With this being the case, I'm not sure why he's concerned with WHY they believed it. There are only two possibilities, they knew it was a lie, but acted like it wasn't anyway - or they actually thought it was true. Neither one meets his Burden of Proof. That being said, and since I have nothing else to rebut yet, we can make a couple of guesses. I'll do this now and back them up with historical examples. 1. They were in it for the personal advantage: Like Joseph Smith - Founder of Mormonism. Joseph Smith created an entire religious cult around himself for the obvious purpose of personal gain. Then he was killed for it, and despite having opportunity to just admit the whole thing was made up, ended up dying without recanting any of it. 2. They were crazy and deluded: Like the People's Temple followers of Jim Jones. Jim Jones, another cult leader convinced more than 900 of his followers to kill themselves for their faith. This after also giving up all of their worldly possessions, leaving their friends and families to live on a commune with their leader. It's worth noting that Jim Jones himself, also killed himself for his delusions. PRO has theorised that we should give the disciples' belief more weight because they were willing to go to extreme lengths for it - but the evidence from history shows that this just isn't proof that they were believing in anything but a lie. I thank the judges for their time so far. I look forward to PRO's next round where he will present some actual tangible proof that Jesus was restored again to his pre-death state. For now, this resolution has been negated! A large thank you to my opponent for his detailed response. I have heard some interesting objections to the Resurrection but my opponent brings forward some unique arguments. I will be addressing these in order my opponent has placed them. First, let me say I accept my opponent's definition of death and resurrection. I also would like to make clear I believe Jesus rose physically and in the same body. "but our personal conviction is that, as the focus of the cult of Christianity, the early church simply rewrote the historical account to claim that he was resurrected." My opponent has chosen to use the word "rewrote", I don't think I have to point out the obvious problems with this usage. In order to claim something was "rewritten" one would have to have something that was originally written. If I have re-written my resume, that means there was a resume that was "originally" written. The problem is that there is no competing historical narrative that has Jesus staying dead. If scholars had even a shred of Paul's letters or the gospels wherein Jesus never returns to life, nor claims to be resurrected, we would have evidence of my opponent's statement. There are no alternative traditions. All four gospels agree Jesus returns to life, Paul's letter provide nothing to the contrary when they are not agreeing with the gospels concerning the fact that Jesus was raised. My opponent cannot appeal to an alternative written tradition that does not exist, or at best, did not exist at the time of the early church being formed. Besides this, the apostles would have nothing to gain by doing this, but would only be hurting their cause, more on this later. Also, my opponent has stated that the burden of proof is solely on me, while I certainly have the burden of proof, I would like to make the point that we do not have video footage of Jesus rising from the dead. The Resurrection becomes the only option when it can be shown the other options do not account for the data we have. Now let be clear here I do not for one second believe that Jesus was only fully human, I am of the last belief, that Jesus is fully God and fully man. However, even going with my opponent's syllogism, I think there are still issues with this. 4. Jesus the man was not resurrected. Again, I am arguing against a syllogism which I happen to believe to be correct, because, as I stated before I do not believe Jesus was just a man, and if He was, I do not believe He would have been Resurrected in the first place. So I will not use too much more time arguing against my opponent's first syllogism, because I do not have any contention with it in this particular regard. I do not argue that Jesus was nailed to the cross without a human nature. Of course nobody can walk up to heaven and kill God, that is not possible, and if Jesus did not have a human nature He could not have died indeed. I will not argue too much more against this premise, I do not argue this at all. In fact the apostle Paul stated Jesus was put to death "in the flesh" (1 Timothy 3:16) So this syllogism, like the first one, stands pretty well, however, it is not being argued. Now for the third one, which is what is being argued. I'm guessing that PRO, like many modern Christians may subscribe to the theory that Jesus was both fully man AND fully God. If this is the case, then he will need to explain how exactly God can die, and also dig up some evidence for us that proves that whatever that resurrected Jesus looked like, that his body was restored to its pre-death fully human state." "We'll also reserve the right to point out that the Bible also paints us Humans as eternal in nature as well. John 11:25-26 says that we never really die. Even when we die, we live. And that people who believe in Jesus will NEVER die. Assuming that Jesus believed in himself, the Bible tells us that he didn't actually die - so therefore he can't have been resurrected!" 29And shall come forth; they that have done good, unto the resurrection of life; and they that have done evil, unto the resurrection of damnation"
If these people are in graves, it implies they must have at one point ceased to be alive. My opponent's interpretation of these verses is quite bizarre because all throughout the Bible people die. "They were in it for the personal advantage:Like Joseph Smith - Founder of Mormonism. Joseph Smith created an entire religious cult around himself for the obvious purpose of personal gain. Then he was killed for it, and despite having opportunity to just admit the whole thing was made up, ended up dying without recanting any of it. " Firstly, Joseph Smith never had a chance to recant, he was shot multiple times by a mob. In regards to my opponent's question, I am concerned with why they believed it because that would deal with the question of appearances. My opponent has not argued that the disciples did not experience appearances of the Lord, I will guess then that my opponent will not dispute this? The disciples went around teaching a crucified Messiah. Telling people the King of Israel, the promised redeemer spoken of by the prophets was under the wrath of God, and was crucified is not a message that would bring personal gain. Only ridicule and ostracization. 2. Romans and Greeks lived in a society where only slaves and rebels died by crucifixion. Telling Romans that the Son of God, the King whom they must bow the knee to and worship...was killed in a manner similar to our gallows, was unthinkably absurd. Christianity's critics from the second century argue this exact point. The social absurdity of the cross cannot be overstated. This cannot be overlooked, and I fear my opponent has bypassed these social realities, that Christianity had so much against it, preaching a Jew to Romans as God, preaching bodily resurrection to Greeks who believed matter was to be escaped, not returned to, to tell people that the Messiah was a carpenter from Galilee with no social status, and ultimately, to tell the Roman empire they must not worship Caesar. My opponent has not given any examples of what the disciples actually gained by spreading this message. NOBODY would have gone around preaching this unless something actually happened to spur them to. It just doesn't work. Beside all this, I challenge my opponent and the reading audience to list what the disciples actually gained besides death and persecution. Mormonism cannot be compared to Christianity or the resurrection in this regard. "2. They were crazy and deluded: Like the People's Temple followers of Jim Jones. Jim Jones, another cult leader convinced more than 900 of his followers to kill themselves for their faith. This after also giving up all of their worldly possessions, leaving their friends and families to live on a commune with their leader.It's worth noting that Jim Jones himself, also killed himself for his delusions." My opponent has now appealed to "crazy" as a reason the disciples believed Jesus rose from the dead. Well I will respond with this, what type of mental illness exists that causes a group of people to believe a man returned to life from the dead? I am not aware of any. Let's just say for the sake of this discussion, this was the case, that the disciples after witnessing the seeming defeat of their Messiah, suddenly came under some mental illness of delusion that He had risen from the dead. 1. What causes the apostle Paul, a former Christian hating Pharisee to suddenly contract this same condition? And does this condition include hallucination? Because Paul's conversion was not based on a whim, it was based on a sighting of Jesus alive. My opponent has not addressed the post resurrection appearances. 2. Why didn't the Jews stop their delusions by providing the body of Jesus? I will not accept anything less from my opponent than a satisfactory answer to those questions. Unlike the Jim Jones movement, the claim of the Resurrection was falsifiable. The claim was never falsified. Christianity could have been stopped if the Sanhedrin produced Jesus' body. What does my opponent make of these claims? 2. Personal gain is not a valid argument, as Christianity was so socially absurd at the time, the only thing the disciples would gain is death, and they did. 3. Mental illness or delusion is not satisfactory because we have outside conversions from those not pre-committed to Jesus. Namely Paul, and any delusion would have been negated by the Sanhedrin producing a body. 4. Delusion is not satisfactory because we have appearances to deal with, also my opponent would like us to believe 11 people all came under the same belief that a dead man rose from the dead without ANY motivation to start this belief. So it is my contention, that the post resurrection appearances, the conversion of Paul, the absurdity of the Christian message being ignored by the apostles, and the survival of belief in Jesus of Nazareth despite His manner of death, is best and only explained by the simple explanation. The apostles believed Jesus rose from the dead because He did. My sincere thanks to my opponent for his latest round. There are a couple of minor points my opponent has attempted to pull me up on, and I'll address those in this round. However they don't dramatically affect my side's case, or support his, so for the sake of clarity, I'm going to focus this round on the main scoring points. I'll effortlessly blend these minor points into these as we go. Let's be very clear about what's going on here. PRO has the burden of proof in this debate. He admits that he doesn't have video footage of the Resurrection itself. That's a shame, it would have made a compelling case. "I do not believe Jesus was just a man, and if He was, I do not believe He would have been Resurrected in the first place." So PRO believes that Jesus was also God, and therefore has supernatural abilities. That's a nice, (and convenient) position for PRO to be in, but I'm left wondering if he expects us all to simply take his word for this. Seems like an awfully big stretch. He hasn't presented any evidence of this fact, except for the fact that Jesus had some followers who believed he was God, and that the Holy Text that followers of this religion also claims that he was God. If this is what constitutes evidence for truth, then I'm very happy to present the following religions which also have a human who is claimed to be God by their followers, and have "Holy Texts" that back this up. My point is this: Disciples and Holy Texts are NOT valid evidence for the veracity of their claims. Perhaps PRO can supply some evidence from OUTSIDE of the religion/cult which would substantiate his claims of Jesus' divinity? To this end, my opponent has asked me to clarify what is meant by the term "rewrote History". It's quite simple, and exactly as he described. The Historical account is that Jesus of Nazareth was a fully human man, who was a bit of a cult leader of his time. He was brought up on charges and eventually crucified, confirmed dead and buried. "Christus, from whom the name had its origin, suffered the extreme penalty during the reign of Tiberius at the hands of one of our procurators, Pontius Pilatus"
"... the man who was crucified in Palestine because he introduced this new cult into the world... "
There are several non-biblical accounts describing Jesus and relating the history that he was put to death. None of them mention him coming to life again. This same truth can be said of many historical figures. In fact MOST historical figures. We mention that they die, and then we move on to other things. Christians are the ones who have rewritten history, (in much the same way that conspiracy theorists have done with figures like Elvis or Michael Jackson) to claim that Jesus actually rose again. PRO's only "evidence" for Jesus's actual bodily resurrection is that life was tough for the disciples and why would they do that to themselves when they could have just admitted the whole thing was a hoax? Unfortunately, a question is not evidence. I've offered two possible reasons they would have done this, and provided examples of other people in history who have done the same thing. But ultimately, we don't know why they did it. I get it. It's weird. Guess what... people do weird stuff like this all the time. Just because an action someone takes defies logical explanation - does not mean we have to jump to the conclusion that whatever they claim to true actually is. Especially when it defies all known truth in the world today. It's at this time as well, that I should point out that not everyone needed to be in on the lie. Almost everything PRO is basing his assertion on comes from the Gospels and the Epistles. These were written down by Men - only a handful of men at that, and many decades after the fact. What if they lied? Assuming they were telling the truth, what if only one or two people had spread the lie in the garden that fateful day? Now that PRO has declared his position, we can focus on the fact that he claims that Jesus was both God and Man before his "death". PRO has also agreed that to win this debate he must show that Resurrected Jesus was completely killed, and then restored to the same self that he was before he died. 1. God can't die. If Jesus was God, then he never fully died. Therefore he didn't technically rise again. I guess you could argue that he "HALF -DIED"and then partially rose again? But it's not the same. I also supplied evidence that the Bible describes Mankind as being eternal as well. Men like Jesus don't "cease to exist" as our definition for death describes - they simply shift from one plane of existence to another. The bible often describes this state as "being asleep". If PRO wanted this debate to centre on the physical Earth, then he really should have made that clear from the beginning. Given that PRO's contention is that Jesus was supernatural, and the world we inhabit exists alongside the supernatural, it's not logical to assume that he was only talking about the physical part of Jesus and the physical realm of Earth. 2. Resurrected Jesus has not been proved to be a Man. Using PRO's own source of the Bible, Resurrected Jesus showed many things that indicated that he was not the same human he was before death. His face was not recognised by several people who knew him prior to death. He could walk through walls. He could vanish at will. He could change his appearance. He could function normally with grievous wounds, which apparently didn't bleed despite being open wounds. He could fly... the list goes on. Couple this with the fact that despite us having several contemporary secular authors mentioning Jesus' existence BEFORE he died, we have no such secular written record from people who observed him AFTER he died. Seems to me that this would be something that might have made the news. There should be a record of this somewhere. Perhaps none of the 500+ people PRO claims Jesus revealed himself to had a pen handy? Assuming PRO convinces us all of Jesus' deity, AND that he fully died despite being immortal, AND that he rose again - there is no evidence that he rose to the same body. It would appear to be a different, supernatural, body. This resolution has been negated. Again. Thanks again to my opponent for his response. Before I address my opponent's new objections, I would like to make several things clear for the judges and readers. 1. My opponent has used the term "lie" and "hoax" in his last round in reference to the Resurrection. I think this makes it quite obvious my opponent is not coming to the historical evidence objectively, but has a pre-commitment to the idea that the disciples were lying, and his defense of this theory, when presented with evidence to the contrary is that "people do strange things". 2. My opponent has not addressed the post crucifixion appearances which I have bought up twice. 3. My opponent has not addressed the socially absurd teachings of Christianity which would have made the religion of Christianity the worst possible lie anyone could have constructed if they were going to try and deceive people. Unfortunately, my opponent has not defended his theory that the disciples were lying against my evidence to the contrary, he has simply stated people do strange things. I do indeed agree with this. People simply do not rise from the dead. However, I would add a very important caveat. People do not simply rise from the dead under natural circumstances. I certainly wouldn't argue that Jesus' Resurrection was a natural event that took place through known processes. That would not be a miracle, just a rare occurrence. My statement here was that if Jesus was just a man, His claim to be the Son of God was then not true and He wouldn't have been vindicated through the Resurrection. "So PRO believes that Jesus was also God, and therefore has supernatural abilities. That's a nice, (and convenient) position for PRO to be in, but I'm left wondering if he expects us all to simply take his word for this. Seems like an awfully big stretch. If this is what constitutes evidence for truth, then I'm very happy to present the following religions which also have a human who is claimed to be God by their followers, and have "Holy Texts" that back this up." I am certainly not using the New Testament to establish that Jesus is Divine, in fact, I wasn't trying to convince anyone that Jesus is divine. If we have no satisfactory alternative, then that means Jesus rose from the dead, which means His claims about Himself are true, and therefore His Resurrection is proof of His Deity. This is definitely logical, but it was not the scope of my argument. I never appealed to the New Testament to prove Jesus' Deity, because I wasn't trying to prove it. My opponent is fighting straw men. "There are several non-biblical accounts describing Jesus and relating the history that he was put to death. None of them mention him coming to life again. This same truth can be said of many historical figures. In fact MOST historical figures. We mention that they die, and then we move on to other things. " "Couple this with the fact that despite us having several contemporary secular authors mentioning Jesus' existence BEFORE he died, we have no such secular written record from people who observed him AFTER he died. Mr. Nzlockie, you mention we have no secular sources that mention Jesus being alive after He died. Would you consider a source referring to the Resurrected Jesus a SECULAR source? If so, I have four great documents I would like for you to read! In all seriousness, if an early source talked about Jesus being alive and Resurrected, that would have either been included in the New Testament, or would not be regarded by my opponent for not being "secular". To expect pagan writers like Tacitus or Lucian to believe a claim about a Resurrected Jewish Man who taught there is only one God and died a slave's death is simply not reasonable. If they did, and wrote what they saw, that, for all intents and purposes would make them Christian writers, who agree with the Gospels, and therefore no longer "secular", if my opponent is willing to say maybe they sincerely would have reported what they saw, why is my opponent not willing to do so with the Gospel writers? Truthfully, let us address the claim that there are no sources referring to Jesus' Resurrection. 1. My opponent has stated that the Resurrection would have made the news. The problem with this line of thinking is that there was no news in the ancient world. I would like to give my opponent an analogy, when Mt. Vesuvius erupted, much of the Roman empire was affected, and one entire city destroyed. How many source documents do we have on this? ONE. By Pliny the younger. 2. My opponent asked me if nobody had a pen handy. To that I say no, they didn't. The process of writing in the ancient world was far different from what we know today. Nobody could go down to Office Max and buy a notepad and a nice ballpoint. In the ancient world, things were written down on expensive vellum or animal skin, which those 500 people who were probably mostly peasant class would not have been able to afford. If they could read and write at all this is. 3. My opponent has stated there should be a record of this somewhere. To which I reply, there is the New Testament. My opponent has ruled this out a-priori however, and yet still demands a written record about Jesus rising from the dead. "God can't die. If Jesus was God, then he never fully died. Therefore he didn't technically rise again. I guess you could argue that he "HALF -DIED"and then partially rose again? But it's not the same. " He did not half die, and He was not half resurrected. As I argued in my previous round, His body completely died, and His body was completely resurrected. What happened to His soul and Spirit in that interim is beyond the scope of this debate. "2. Resurrected Jesus has not been proved to be a Man. Using PRO's own source of the Bible, Resurrected Jesus showed many things that indicated that he was not the same human he was before death. His face was not recognised by several people who knew him prior to death. He could walk through walls. He could vanish at will. He could change his appearance. He could function normally with grievous wounds, which apparently didn't bleed despite being open wounds. He could fly... the list goes on. Assuming PRO convinces us all of Jesus' deity, AND that he fully died despite being immortal, AND that he rose again - there is no evidence that he rose to the same body. It would appear to be a different, supernatural, body. What happened to Jesus' body after His resurrection is a glorification. It is the same body as before but not of the same nature. It is not subject to death or illness. Why this is relevant to the question of did He rise is not clear to me. If my opponent is trying to argue Jesus underwent some sort of "spiritual" resurrection, or that He was raised in a completely separate body, my opponent has contradicted his first definition of Resurrection. My opponent has given alternative theories to the Resurrection. Namely, the disciples were lying or deluded. I have shown that believing the disciples were lying is simply unreasonable given the nature of Christianity and the beliefs held during the 1st century in their society that they preached. My opponent has not addressed the question of the post resurrection appearances of Christ, that is, they believed they saw Him again, and my argument was we have enough historical evidence to believe that the disciples truly believed this. The question then becomes why? I have not used the Bible to prove my points in this debate, I have treated Paul's letter to the Corinthians the same a historian would, as a document giving us insight into what the early church believed. The question again becomes, what made them believe this? So far, my opponent has not offered any alternate theory that would better or more satisfactorily explain the question. Therefore belief in Jesus rising from the dead is not only reasonable, it's necessary. Well what an exciting debate this is turning out to be! Thanks again to my opponent who continues to try to make his case, and to the Judges who have hung in this long! PRO is justifiably concerned that our side might be a little biased in making our case. Let me put his mind at rest. This is a debate. We are arguing the CON side of this resolution. We are most definitely a little biased. As is he. The Judges are the only ones who are supposed to be objective here. It's our primary contention that most of the Biblical account is false. Some of it is likely accidentally false, as the authors repeat back lies presented to them by others as truth, but I'm sure there were some who KNEW the truth and simply lied to perpetuate the myth that they had devoted their lives to. The important thing here is that we are not being BLINDLY biased in this assessment. The claims made by this document are simply not backed up by anything we see in the real secular world, past or present. I believe the judges will agree that we would be justified in being skeptical when someone claims that they saw someone get put to death and then become alive again. Speaking of bias though, my opponent's position is that we should believe the accounts given to us in the Bible because... the Bible says they are true? My esteemed opponent has continually brought up a couple of points which he obviously gives much more weight than we do. Namely that people saw Jesus after the "resurrection" and that it seems surprising that the disciples would perpetuate a myth they knew to be false with no discernible benefit to them personally. I feel like these have been spelled out and addressed already, but to be very crystal clear, I'll do it again this round. If the Judges are already on my side on this one, I'll make sure to label that one clearly so you can just skip it! What a tease! I pointed out that although we have some secular support for the idea that a man named Jesus existed, these sources all terminate at the point that he dies. None of them mention the extraordinary fact that he magically appeared walking around after the Crucifixion, despite the fact that all of them apparently had a pen of some description. My opponent then intimates that he has FOUR such documents referring a resurrected Jesus - but doesn't give us them! I secretly suspect that's because these documents are likely from the Bible, which is most definitely NOT secular. If I'm wrong, then I beg him to please show us. He's defended his position that events don't have to have sources to be considered true by citing Mt Vesuvius. As you can see, there's not really a comparison. Vesuvius comes from one account, it's true. But when we hold that account up to the light, it holds up. The account is verifiable by physical evidence. So it is most likely true. Not so the Jesus account. I've made it pretty clear that our primary objection to the resolution is that Resurrection is implausible, impossible and unlikely based on any object metric of evidence. However, because I'm a two for one kind of guy, I like to give a secondary argument in my debates. 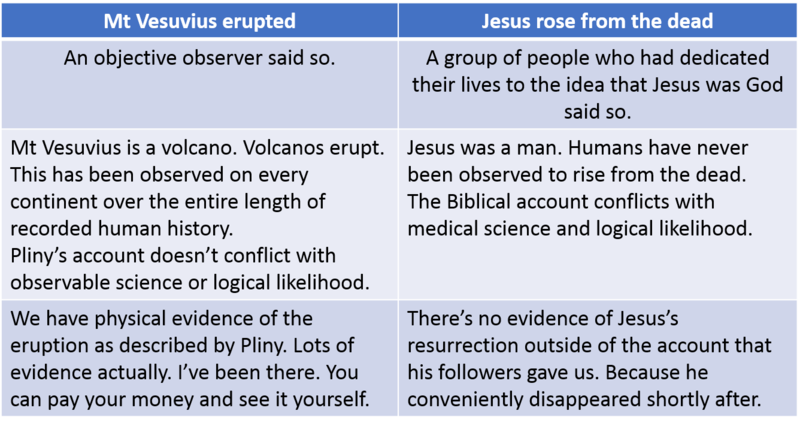 Assuming that we accept that Jesus DID, despite ALL evidence to the contrary, rise again - did his resurrection meet the criteria of the definitions set out in the first round of this debate? My point is that NO they do not. To meet the terms, PRO needs to show that the resurrected Jesus was the same as the original version. Not only has he not done so, but in his last round he admitted this fact. He claims that Jesus rose again - not to his original body as the definition sets out, but to a DIFFERENT body. So he didn't really rise again, he simply morphed from one body to another. Transitioned from one state to another. If we accept that Original Jesus was Physical Man and Spiritual God, then which one died? God can't die, otherwise he wouldn't be God. So clearly it was Physical Man Jesus that died on the cross. My contention would be that since Jesus is both parts, and only one part died, then he didn't really die at all. No death, No resurrection. But even if we accept that Jesus'partial death still counts, PRO needs to prove that it was Physical Jesus that rose again. Otherwise the one half that died, did NOT rise again. Again, No death, No resurrection. PRO's own evidence from the dodgy Biblical account paints a picture of a resurrected Jesus that was intangible, could fly and was not immediately recognised by those who formerly knew him. That's it for my last constructive round. I thank the Judges for their time, in the final round I'll simply summing up my case. I'll try to keep it short. OK, PRO, you've continually asked why the Disciples would lie. I've answered this several times, and backed up my hypotheses with examples of historical figures who have done the same thing, but ultimately, unless they tell us, we can never truely know the reason WHY someone does something. Not knowing the motivation doesn't discount the action. Peter and a few of the higher ranking Disciples have left their friends, families and professions to follow this guy they foolishly believed was the saviour of the world. Turns out they were wrong, and he dies. In a panic, their world as they know it crashing around their ears, they decide to perpetuate the ultimate con. "Lets spin a story that he predicted that this would happen and that he would rise from the dead - I think I know some Old Testament verses that we can twist to suit that narrative!" says Peter. "Great idea! "says John, "I'll tell Mary to make up a thing about meeting Jesus in the garden on the way to the tomb." "But how are we going to handle the fact that we don't have anyone who LOOKS like Jesus?" asks Peter. "Let's make it that he can hide his true identity now. He doesn't look the same any more. " John replies. "Will people buy that? Asks Peter. "Seems a bit far fetched. Wouldn't he WANT people to recognise him? Why would they believe it otherwise?" "Meh - they'll believe whatever we tell them. It'll be sweet. I'll doctor the records after the fact and make sure that only the accounts that back our story up will make it into the "proper" Bible. You'll see, it'll be sweet. Besides, what do we have to lose? You want to go back to gutting fish like a nobody again?!" This kind of thing has happened over and over again throughout history. There's no reason to believe it didn't happen this way either. We have very little history of what happened to any of the disciples after the crucifixion - most of what we have comes from Church History. A History that is notoriously unreliable and self-serving. As for motive, it could have been anything. Pride, Lifestyle, Genuine Delusion - we will never know, but all of these options are likely and have certainly occurred several times throughout history. What about the 500 people? IT DIDN'T HAPPEN! That whole thing was made up. It has all the hallmarks of a made up piece of evidence. "Oh yeah, a whole bunch of people saw him at one time - I think there were about 500 of them!" Except we're not given the name of even ONE person who was there, and there are no written accounts by any of those people. We're not even told where and when this sighting took place! This is the problem when you use the Bible to support claims that defy every piece of secular evidence. The only people that have anything to gain by the Biblical account being true are the ones who either wrote the book or live their lives based on the claims written in it. I'm NOT going to give you an iron clad reason why the Apostles made the claims they did. I don't know why they did it, and it's not relevant at all. The EVIDENCE does NOT support their claim that Jesus rose to life again after being killed. Greetings again and thanks to my opponent for quite a debate. I will off the bat begin by tackling the Mt. Vesuvius issue. Firstly, I am seeking to make my responses shorter simply because I want to avoid getting sidetracked and going down rabit holes. Let me begin by saying I do not think my opponent understood me mentioning Mt. Vesuvius very well. My opponent has conveyed in his chart that to believe in the eruption of Mt. Vesuvius is rational whereas belief in Resurrection isn't, He lists several reasons for believing so. Well, that was not my argument. I was not examining the belief in Mt. Vesuvius on the basis of rationality, but that of historical availability. My opponent's argument was that there were no abundant historical sources corroborating the Resurrection, me bringing up Mt. Vesuvius was to show that even spectacular historical events do not have documentation that us moderns would like them to have. I fear Nzlockie has missed this critical point. Moving onto some general statements, my opponent has insisted that I am arguing for the Resurrection based on the fact that Scripture says so therefore it is true. I would like the judges to really ask themselves if this were the case, why the lengthy historical debate spanning from the social world of Scripture, to the methods of historiography, to the psychological state of mind the disciples were in? If I wanted to argue the truth of Scripture from Scripture I simply would have quoted Scripture and debate would be finished. I argued that Jesus' body was the same physical body that He died with, but that His rasied body was one that underwent a process know in Scripture as glorification, which was that His body was now endowed with abilities it did not previously have, which does not mean Jesus' original body no longer exists, or did not rise. A process of glorification is not a replacement. My opponent insists I "prove" that Jesus' body was the same one He died with. That was already done at the start when we both defined resurrection. As we were not debating any other definition. My opponent is bent heavily on this idea that Jesus did not completely die because His God nature did not cease to exist. Mr. Nzlockie, do you have a God nature? If the answer is no, then if you were killed on a cross would that God nature cease to exist? The answer would be no because you don't have one. Since your God nature is not dying on the cross, does this mean your physical body is not truly being killed either? ""Lets spin a story that he predicted that this would happen and that he would rise from the dead - I think I know some Old Testament verses that we can twist to suit that narrative!" says Peter. "Will people buy that? Asks Peter. "Seems a bit far fetched. Wouldn't he WANT people to recognise him? Why would they believe it otherwise?" "Meh - they'll believe whatever we tell them. It'll be sweet. I'll doctor the records after the fact and make sure that only the accounts that back our story up will make it into the "proper" Bible. You'll see, it'll be sweet. Besides, what do we have to lose? You want to go back to gutting fish like a nobody again?!" I like this story a lot, Peter has quite a sense of humor here, I think even if the Resurrection did not occur, we must give these men credit. 11 Peasant class blue collar guys from an obscure village in Palestine managed to pull the single greatest hoax in human history, and their little prank forever altered the entire course, history, and destiny of the entire human species, so much so that they could never have conceived that their shenanigans changed countless billions of people, events, and the world itself. If only these men knew that their little attempt to trick people into believing in their Carpenter Messiah would set of a chain of events so profound in magnitude that 2000 years in the future, the name of Jesus Christ is known just about universally, and people are still arguing about this to this very day. Or maybe Jesus rose from the dead. "Great idea!" Say John "I'll tell Mary to make up a thing about meeting Jesus in the garden on the way to the tomb"
"But how are we going to handle the fact that we don't have anyone that LOOKS like Jesus?" Asks Peter. "YOU GOT LARGER ISSUES THAN THAT!" Interjects Thomas. The rest is History folks! Thanks for a wonderful debate! In this final round, I'll once again thank my opponent for the spirited debate, and to the Judges for their time! As this is the final round, I'll quickly sum up my side of this debate and explain why I've won. Then you guys can go vote and we can party. The resolution was clearly defined. PRO needed to prove that Jesus Christ, a being both fully man and fully God, died and was restored to full life again. I gave PRO several choices as to exactly what Jesus'make up was, and it was him that argued that Jesus was both Man AND God. To be clear, it is PRO's assertion that if Jesus was just a man, he would not be the person we are debating. We also agreed on the definition for Dying. It was to be "the end of his life." Finally, we decided that to meet the burden of "Resurrection", Jesus would have to have been restored to the same state that he was before he died. Anything else would not meet the definition of resurrected, since he would now be transitioning from one state to another. All of this was decided way back in round one. Our case is pretty simple, and it consists of two layers. If PRO fails to defeat even ONE of these layers, then we have won this debate. 1. Jesus is God. God can't die. You can't be resurrected if you didn't die in the first place. PRO doesn't deny that Jesus' God nature is an integral part of who he is. If "Jesus" was to die, then in order to meet the definition, the whole of him would have to die. Since part of him is God, and God can't die - Jesus was never fully dead. PRO side stepped this argument by claiming exactly the same thing we're accusing him of. That Jesus didn't fully die. He was saying that only the Human part of him died - and that that's OK. It still counts. 2. Jesus was not restored to the same state that he was beforehand. So if we humour PRO and we buy his argument that somehow when half of Jesus dies, that still counts as Jesus dying, he needed to show that the Jesus that he claims was sighted after death was the same one that was around beforehand. We pointed out that the Biblical account, (the ONLY account that claims this resurrection) makes no attempt to support this. The resurrected Jesus can phase through walls, doesn't appear to bleed, can fly, and most tellingly, is not recognised by anyone who formerly knew him, until he introduces himself. There is exactly ZERO evidence that the Jesus mentioned after death is in the same human body as the one before death. So... burden of proof not met. All of this is great and these points alone should be enough for us to have won this debate. But, the burden of proof was not on us. PRO needed to also show you that it WAS likely that Jesus rose from the dead. I'll be honest with you Judges, I felt that PRO was a little all over the place here. He had some points he thought were good ones, and decided to ignore my rebuttals that exposed them and just kept on arguing them anyway. I admire his persistence. Firstly he tried to use recorded history. In the first couple of rounds he tried to use only non-biblical texts. A move that I admired as we ALL know that using the holy text that was written by people who had a vested interest in the resurrection story being true, would not be considered an objective source. Unfortunately, none of the texts he used actually supported the idea that Jesus rose from the dead, only that he lived and was crucified. A point we weren't contesting. We flipped this point on him and showed that, in fact, ALL of recorded history and ALL of modern science is stacked against the claim that someone can die and rise again three days later. Secondly, he tried to use circumstantial evidence. Since Christianity is around, Jesus MUST have risen. Otherwise it would have surely died out? Essentially he is saying, there is smoke, therefore there must be fire. I'll be honest, we shut this one down by pointing out that the argument was not even close to "Proof, but after that we just felt a little embarrassed for him. It's not an argument, it's not proof. Thirdly, he tried to use biblical account to support his story. He used verses from the Bible which cited several times that Jesus was seen after he rose again. Leaving aside the fact that this source is about as biased as you can get, we pointed out that none of these verses support the idea that Jesus was restored to the same body he inhabited previously. In fact, if he was restored to a completely different body, (something PRO supports, despite it killing his case) the stories would actually make more sense. Finally, he appealed to logic. Why would the disciples commit to this lie? Even though there are reasons, I don't like any of them, so therefore the incredibly unlikely story must be true! We started off by citing NUMEROUS historically verified examples of other people who had committed to similar lies, even to the point of death. We thought that would be the end of it. It's unusual for a NEG side in a debate to be forced to win by proving a hypothetical - we didn't think that's what he was trying to do, but it was weird that he kept pushing it. As far as our rebuttal to this point goes, we simply pointed out that logic is actually on OUR side. Sure it's a little unusual that people would commit to a lie to the point of dying - but it's hardly without precedent! We postulated one potential scenario that could have plausibly taken place that explained the whole ting, and there are literally thousands of others. But ultimately it is even MORE unlikely that a human died and was risen from the dead. For that matter, it's unlikely that God exists, or that he once existed in some hybrid God-Man form. Logic is firmly on OUR side in this debate. Judges, we believe that PRO has failed to even come close to meeting his BOP in this debate, in fact he's done a pretty good job of supporting OUR points against the resolution. Conversely, we believe that after four rounds, our original points stand unopposed. Thank you for your time, please vote CON! You're a God-send nzlockie! I look forward to our exchange. Technically I actually agree with the resolution but I don't mind playing devils advocate for you to ensure that you get some decent preparation for your real world debate! Pro spent a lot of the debate on the defensive, and didn't defend terribly well. Most of the arguments made were repetitive and didn't actually answer valid arguments raised by Con. A lot of time was spent arguing over tiny, highly specific details that were really just semantics. Pro, pick your battles. When Con said "crazy," it was clear to me he wasn't insinuating that these people had psychosis, but that they were hoodwinked and gullible and believed something impossible happened, not dissimilar from people caught in modern-day cults. This is a more general piece of advice than that, though; focus on your opponents' big picture argument, not the tiny details. Con, nice work. I saw some repetition from you as well, but it probably wouldn't have been necessary if Pro hadn't been in the first place. One small point was your usage of the Oxford definition of "secular." I was hoping that you would give a somewhat more merciful definition for the sake of this particular topic - most people I know who discuss this event will settle for sources external to the Bible, since any work mentioning Resurrection of any kind would probably not pass the usual definition of "secular," even if they were describing a real event. I think you might also have missed one of your biggest weapons in this debate when you skimmed over the idea that "most of the bible is a lie." Maybe lie isn't the right word, but if you approach religious topics with the idea that the holy texts are mostly fictional and allegoric literary works, you have a lot more dismissive power in this kind of debate. I will be completely honest with my judging here. I speed read the entire debate and got a nice feel for the arguments. WIth that said I found Pro's evidence extrememly lacking and as Con pointed out, a bit all over the place and unstructured. I don't buy the word play that jesus cant be god because god can't die...well if jesus is historically accurate then that's not the case, but if jesus is god then clearly that's not true. So it realy comes down to the facts. And as far as those facts are concerned I see no real EVIDENCE which indicates beyond a reasonable doubt that Jesus was resurected, nor even that it was probable. From the Objective perspective I can't believe anything I haven't already observed and I would either need some wildly convicing evidence to prove the resurection or some serious philosophical bombshells. I get neither of those with the simple arguments by pro which simply assert that nobody would like about god and they are being super serious and legit...but that is simply not evidence. CON ruled the debate from his initial outline to the framing of the debate from the begginng. TBH i feel that this debate is a bit vague and lopsided because how could pro ever meet the burden of proof of providing evidence and not just making a solid case that it is very possible to have happened. Pro I think you should have spent less time in the muck trying to refute Con's demands for evidence and instead spoken even more to how people perceive jesus and his impact, which would have went well with a multi level conception of god (using several possible explanations of what god IS) but instead we are left with a fukbucket of assumptions and a fairly biased grading rubric. It was a very cordial debate which made it easy to read and I highly appreciate that. I do feel bad because i may be biased, as someone who has often been atheistic however I do really believe that Con made the more convincing and complete argumentation and that Pro definitely had some burden of proof yet to fulfil. thanks and I look forward to perhaps another round. I've read this sentence lots of times now and I just can't understand it. Could you please clarify what you mean here? "...if jesus is historically accurate then that's not the case, but if jesus is god then clearly that's not true." My point was that God can't die. It's one of the things that makes him God. Since PRO's position was that Jesus WAS God, then that part of him would have had to have died as well to meet the definition of "Dead". If the "God" side of Jesus didn't die, then did "Jesus" really die? PRO said that Jesus God nature was an essential part of who he was. The reason I focussed on this was that I wanted to make the point that Ressurected Jesus didn't display ANY of the Man traits. Instead he displayed lots of God traits. He wasn't even physically recognised by people who knew him really well. So isn't it more plausible that the Man half of Jesus died and stayed dead? I felt like that was a really strong case, and from a narrative level I wanted it to come after posing the question of whether he even died in the first place. "I think even if the Resurrection did not occur, we must give these men credit. 11 Peasant class blue collar guys from an obscure village in Palestine managed to pull the single greatest hoax in human history, and their little prank forever altered the entire course, history, and destiny of the entire human species, so much so that they could never have conceived that their shenanigans changed countless billions of people, events, and the world itself. If only these men knew that their little attempt to trick people into believing in their Carpenter Messiah would set of a chain of events so profound in magnitude that 2000 years in the future, the name of Jesus Christ is known just about universally, and people are still arguing about this to this very day. Or maybe Jesus rose from the dead." I don't think Con provided a clear refutation to this, and therefore, while debates about spiritual topics are always close, I would award the win to Pro. As Con pointed out, Pro has the burden of proof, but it is by a preponderance (showing that their case is more plausible) not by excluding all doubt. Overall, Pro's case was more convincing. Pro: Pro seemed to spend too much space defending against the arguments against the idea of Jesus being fully God OR fully man. I would have dismissed it in one or two sentences pointing out that wasn't what I argued. Also, Pro put too much emphasis on the word "crazy" in round 2 - while I don't believe that Con presented a convincing possibility, Pro was too defensive. Con: As I said in the RFD, I wouldn't have refuted ideas that no modern Christian believes in the first speech, but rather have used that space otherwise. Also, Pro never said that the Bible should be believed BECAUSE the Bible says it should be believed - that's a strawman. You obviously had a pretty significant issue with my first round and I'd like to clarify this - because I had the same issue. PRO typically sets the definitions in their first round. This is critical in EVERY debate, but especially in a debate like this, where there are lots of interpretations of various doctrinal issues. Religious debates often end up going nowhere fast as both parties use their constructive rounds to establish a common baseline on things like the true nature of Jesus. This debate only had three rounds. For both parties, (but especially CON) the last round is not supposed to be constructive. Since PRO failed to set the definitions in the first round, I was forced to do this myself, knowing that his second round could be spent debating those definitions. I made the executive decision to define Jesus as being simply Jesus Christ, and then I argued three separate cases for each of the three major interpretations of his Deity. The intention was ALWAYS to drop the two that didn't relate in the second round, once my opponent let me know which one he wanted to argue. This was clearly stated, and as soon as he indicated the position he held, I never referred to the other options again. I get REALLY annoyed when PRO fails to set the definitions in the first round, since it actually reduces the space I have to argue my points, and your assessment actually proves that it is detrimental to CON to be forced into this position. I could have simply argued the "Fully Man and Fully God" position from the start, since I guessed that was probably the camp he would be arguing from, but had I been in his position, I would have immediately exploited that weakness and switched the definition in the second round - thus negating my entire first round. I also agree with most of your other points and I certainly appreciate the time you've taken to judge this debate. Thanks! PS: Out of interest - I really struggled to argue against an argument that essentially said, "The impossible MUST have happened, because the Disciples said it did, even though they had stuff to lose." I cited lots of real world examples where we KNOW that the people claiming the thing happened are found to be wrong, and I guessed that that would be enough, but obviously for you it wasn't. I couldn't PROVE what their motivation for sticking to the story was, but I was able to give lots of potential alternative motivations and then cite real world examples of each of those. I figured that at least that makes my motivations equal to PRO's. I couldn't really see any other way of arguing that line - since there is no record one way or the other. My question to you is: How could I have made my alternative motivations more convincing to you than PRO's one? You, Phos Halas, had a good argument. However, none of this can be proven and therefore I will side with nzlockie. I have created this debate as something of a practice run.I have a live debate about the Resurrection in the future coming up,and would like to talk about the Resurrection with anyone who would like to debate it. I am of course pro in this debate, I am opening this challenge to basically anyone who would like to debate con. Atheists, agnostics, Muslims, whoever doesn't believe in the Resurrection of Christ, by all means, I would like to talk. Also, I have selected a month for time allowed to post, I am currently entertaining family at my house and do not have that much free time, but still would like to start a conversation. As always, feel free to begin, and thank you everyone.